As you all know that I grew up in Delhi and one of the things which still connect me to that place is food. The memories of pachranga gol gappas and Karol Bagh’s Roshan di kulfi and chole bhature can make my mouth water any time. 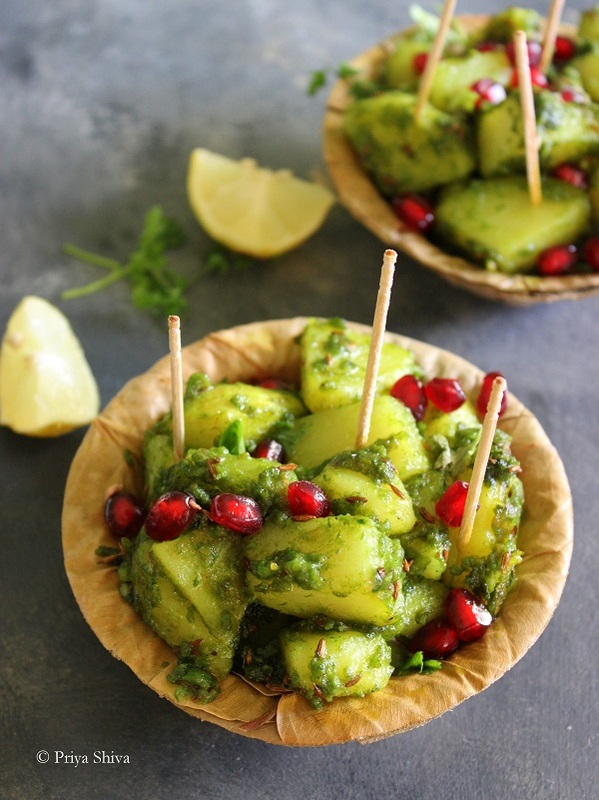 I thought of the days of Delhi as i prepared this Chutney Wale Aloo Chaat today..
Chutney Wale Aloo Chaat is another popular street food from North India. It is also known as Hariyali Aloo chaat. 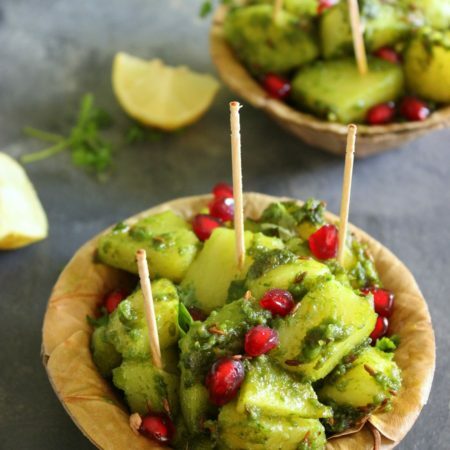 The potatoes boiled and roasted with spices and tossed with Coriander chutney. So, sharing a recipe to make this delicious snack. Try it out and share the feedback with me..
Pressure cook or Boil potatoes they are tender. Peel and chop them in equal pieces. Add coriander leaves, green chilli, garlic and ginger in a blender and blitz it to make a smooth paste. You can add little water while grinding this chutney. Warm oil in a frying pan and add cumin seeds. Once it crackles, roast boiled and chopped potatoes. Add garam masala, chaat masala, salt to taste and stir again. Add coriander paste and toss the potatoes till it get nicely quoted with chutney. Transfer in serving boils, squeeze little lemon juice, garnish with pomegranate seeds and serve.